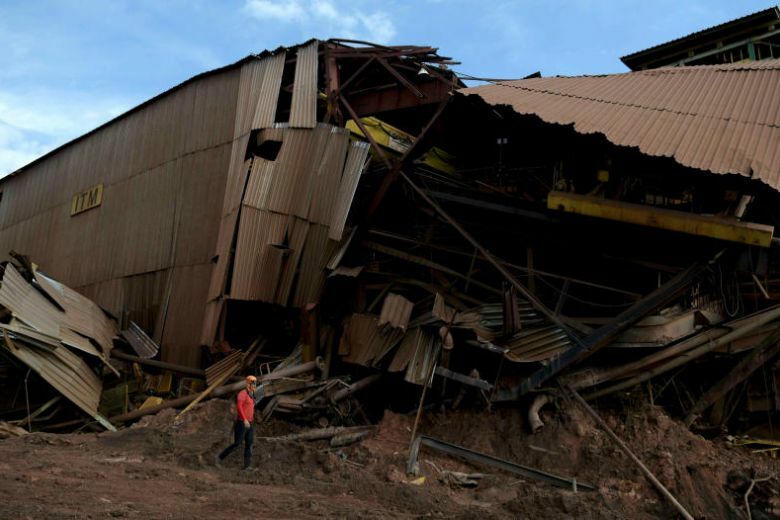 Hundreds of people are feared dead after a dam operated by the mining company Vale collapsed in the Brazilian state of Minas Gerais, releasing a wave of red iron ore waste and causing the worst environmental catastrophe in the country’s recent history. Authorities say that 40 people have died, and more than 300 people remain missing according to the company. 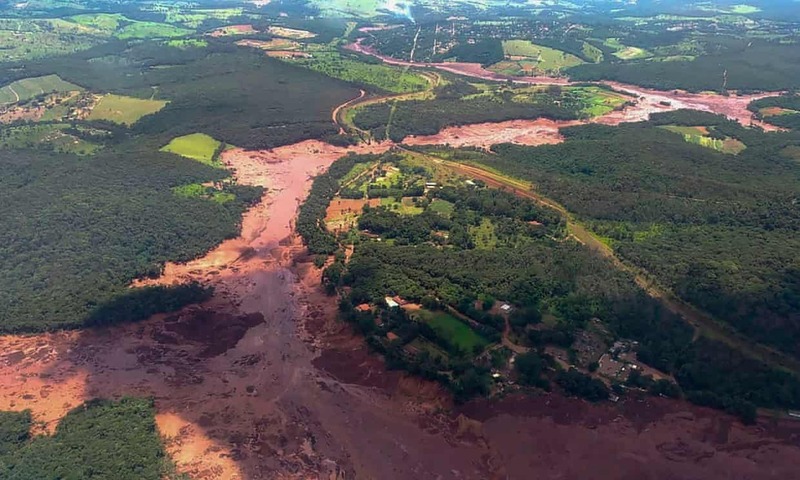 The disaster comes only three years after a similar failure of the Fundão tailings dam near Mariana – co-owned by Vale – which killed 19 people. 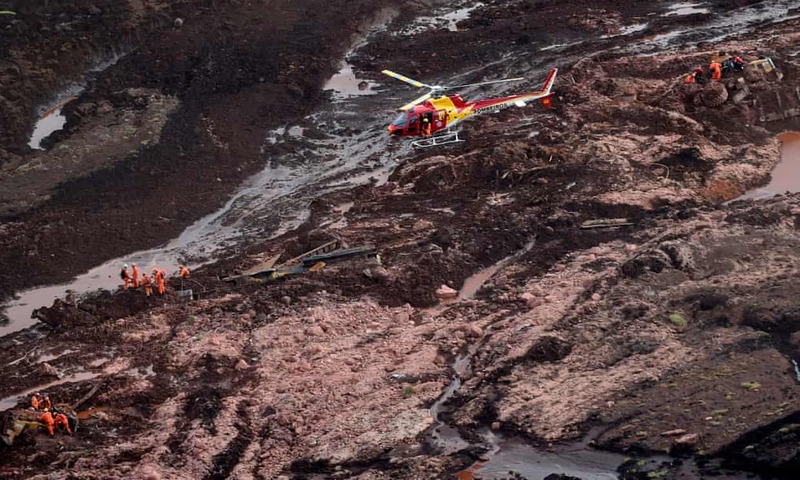 Speaking after the latest disaster, the local fire chief Col Edgar Estevão said 100 people had been rescued from the sea of mud released by the dam. However, Vale later released a list of 412 employees and contractors whom it had still been unable to contact, and the state governor, Romeu Zema, said he did not expect many more survivors. “We know now that the chances of having survivors are minimal and that we will probably rescue bodies,” he said. “I saw a gigantic cloud of dust and a wave of mud. It was one wave on top of another,” one contractor, Mayke Ferreira, told the Folha de S.Paulo newspaper. Ferreira said he had been sleeping in a nearby dormitory when he was woken by an enormous crash. It is not yet clear what caused the tailings dam to burst. However, the Brazilian environmental agency Ibama has already slapped a 250m reais (£50m) fine on Vale for violations related to the tragedy. The company has caused pollution, made the area unfit for habitation and committed other regulatory violations, Ibama said. State prosecutors have also filed a request to freeze 5bn reais in Vale’s accounts to help fund recovery works. Brazil’s new president, Jair Bolsonaro, visited Minas Gerais and flew over the disaster area. 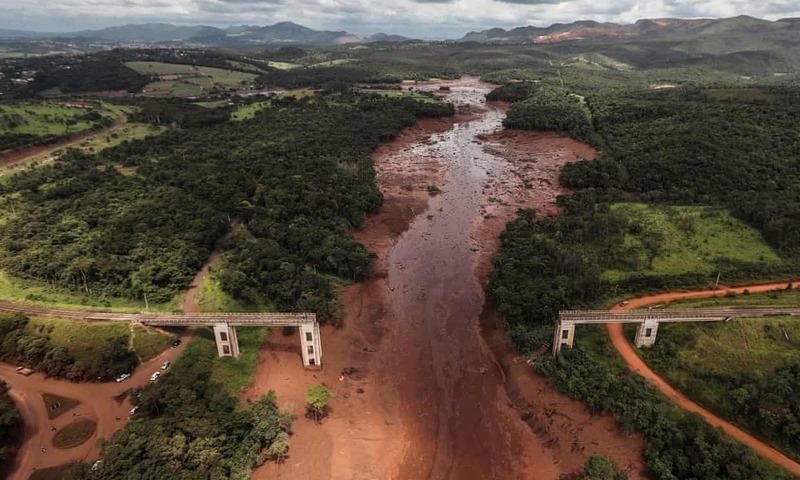 “We will do what is within our reach to attend the victims, minimise damages, investigate the facts, demand justice and prevent new tragedies like Mariana and Brumadinho,” he tweeted. However, environmentalists have accused Bolsonaro of persistently attacking them for calling for tighter regulations at the mine and for failing to take action to tighten safety there. Most of the victims of the disaster were Vale employees or subcontractors, around 100 of whom were having lunch in a canteen on the mine complex when the torrent of mud swept over them. A busload of workers was also killed, it was reported. Maicon Vitor, 22, an electro-mechanic technician, told O Globo newspaper that he had just left the canteen when he heard the roar of the tailings dam breaking. “It came down dragging workshops, offices; the whole canteen which was in front of me went,” he said. Vale said the 86-metre-high tailings dam at the Corrego de Feijão open-cast, iron ore mining complex was built in 1976 and held 11.7m litres of mining waste. It was being decommissioned and had been pronounced safe in inspections. But the National Civil Society Forum for Hydrographic Basins, a network of civil society groups, said that it had urged the authorities not to grant Vale a licence to continue operations there. “The population of Casa Branca is very worried, with good reason,” Julio Grillo from Ibama, told a meeting on 11 December, according to minutes obtained by the Observer. It cost billions to clean up after the Mariana disaster in 2015, which polluted the drinking water of hundreds of thousands. Yet no individual was ever held responsible. “Cases like these are not accidents but environmental crimes,” Greenpeace Brazil said in a statement. “I hope now they will create a new way to mine that doesn’t mount up waste, a safe way of working that does not leave widows,” said Sandra Quintao, a survivor of the Mariana disaster. The Mariana dam was operated by Samarco, a joint venture between Vale and BHP Billiton, an Anglo-Australian mining giant. 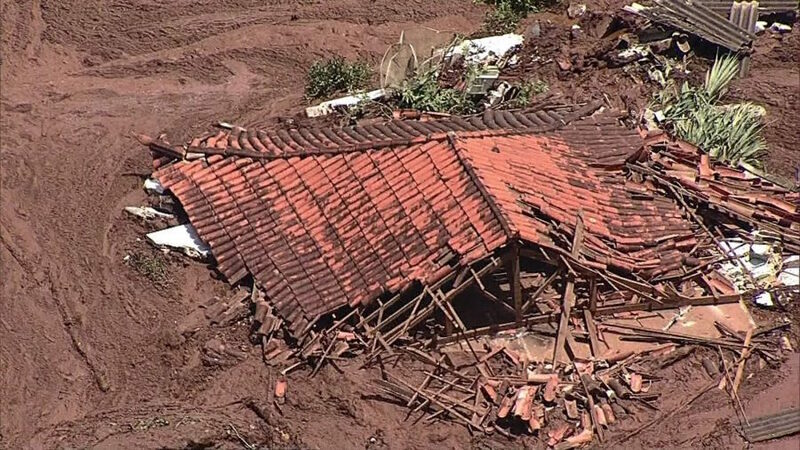 Vale’s Brumadinho mining waste dam failure is all the more tragic because the mining industry knows how to prevent them, yet failed to act. 200 people are missing and some presumed dead because Vale and the rest of global mining industry haven’t adopted the Mount Polley Independent Expert Panel’s recommendations made in response to a similar catastrophic mining waste dam failure in 2014. These recommendations have been globally recognized, including by the United Nations Environment Programme’s 2017 assessment of tailings dams failures, and by the multi-sector Initiative for Responsible Mining Assurance standard. Until these recommendations are adopted and independently verified, preventable mining disasters will continue to occur wherever the mining industry operates. Independent research that analyzes mine waste dam failures since the turn of the 20th century reveals that these catastrophic failures are occurring more frequently. It also projects the trend will continue, driven by economic factors. After the 2015 Samarco mining waste dam disaster, the International Council on Mining Metals published mining waste impoundment guidance that ignored the globally recognized recommendations by the Mount Polley Panel.